Henry David Thoreau has encouraging words to reign in a prompt spring start-up. “An early-morning walk is a blessing for the whole day.” It gets the circulatory pumps moving but you might also find lots of spring surprises. Though it may be a challenge navigating the snow piles, let alone find any crocuses popping from the frozen ground, one thing you won’t be able to deny is the bird activity right now. So when you, yourself are in doubt about the season, these feathery creatures are most certain of it. So get your prompt spring start-up with that early morning walk. You may discover a tiny blossom, a budding tree or simply a bird’s beautiful spring song. P.S. 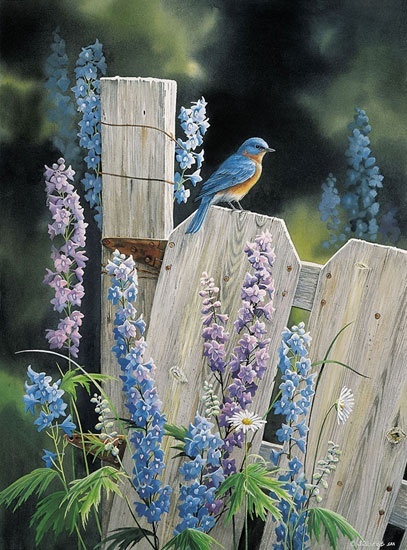 Bluebirds are a favorite and I’ve seen quite a few in the oddest places. Pay attention for these bright blue bursts of color. As for today’s image, well, capturing birds is certainly not my forte. So hence a borrowed photo from someone who can.